BERLIN - Berlin softball head coach Jason Pires had a heavy tan as he walked off the field at Sage Park on Friday afternoon, and it certainly didn’t come from the recent cool and overcast weather in Central Connecticut. No, Pires’ tan came from Florida, where he and the rest of the Redcoats had just returned from what some might see as a vacation, but what the team considered a valuable bonding experience and an opportunity to improve critical aspects of its game. 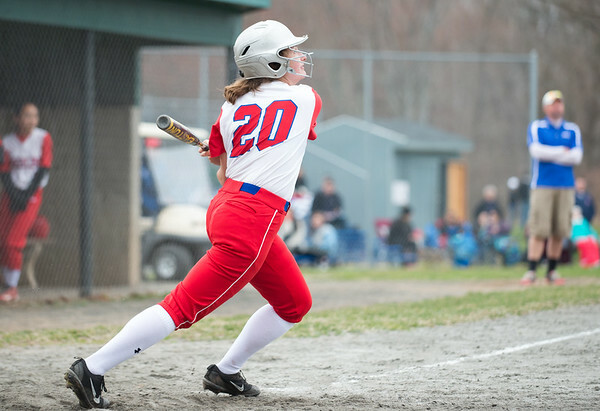 The most notable area addressed in the Sunshine State was hitting, and back in Connecticut on Friday, Berlin pounded out 20 hits, including four home runs, to earn a crucial first victory of the season. The team’s trip may not be a critical turning point in a season that never felt off the rails, even after losing the opening two games in heartbreaking fashion. The Redcoats instead took the week in the sun as simply an opportunity to improve. The big hit wasn’t hard to come by on Friday, thanks to plenty of extra hitting practice in Florida, where the Berlin hitters seem to have rediscovered their power stroke. Like Pires, Walsh didn’t see the team’s spring getaway as a defining moment to salvage a rough start to the season, but it certainly served a valuable purpose. Aside from hitting, Pires wanted to get the team focused again, an issue he had noticed since preseason scrimmages on the home front, when the Redcoats seemed to take a few innings to dial in at the plate and in the field. A similar narrative unfolded on Friday, when Berlin fell behind 3-2 after three innings to an inferior Platt team, but Pires saw his group break out of its chronic early funk much sooner than usual, which is a step in the right direction. Initial focus will be the next improvement on Berlin’s checklist. A week in Florida seemed to awaken the bats, and Berlin hopes a looming matchup with a solid Bristol Eastern squad will help cure any lingering lack of focus when that game gets underway on Monday. The game against the Lancers has been marked on the team’s calendar since before it packed its bags for Florida, and after breaking into the win column upon returning from their trip, the Redcoats believe they’re on the right track. Posted in New Britain Herald, Berlin on Sunday, 14 April 2019 21:02. Updated: Sunday, 14 April 2019 21:05.